We’ve entered a period where Joe investor has stopped feeling the “risk” part of “risk assets.” Short-term memories and rose-colored glasses mean interest rates will always be near zero, credit will always be easy and abundant, and inflation will always be benign. Clouds settled over the euphoria this week as 10-year Treasury yields jumped to their highest levels since 2014. That may prove a tame preview of any disruption spurred by a shocking uptick in consumer prices that sends bond yields and market premiums roaring. Inflation pressures will, inevitably, return. And when they do, it will eventually mean more than raised rates. Eventually, the blind and unfounded faith in the US dollar’s will start to waver. Inflation, even hyperinflation, will ensue. But in the rush to convert currency to real assets, gold, that immutable store of real value, will see such increased demand that it will more than keep pace. 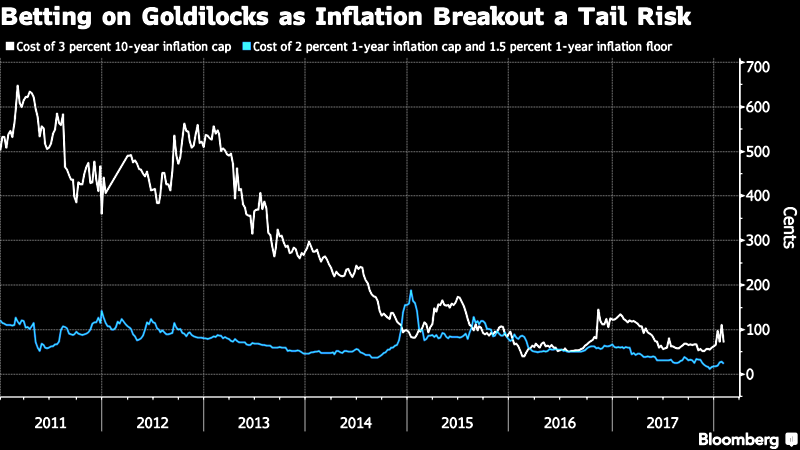 A top European monetary policymaker alluded to this risk as investors signal unabashed confidence that the era of low and stable inflation will endure over the long haul. “From a financial stability perspective, a low inflation risk premium may be a matter of concern if it indicates complacency about future adjustments,” ECB Executive Board member Benoit Coeure said in a speech in Dublin on Wednesday.